The theology of the Biblethat is, its main theme from chapter 1 in Genesis to chapters 21 and 22 of the Book of Revelationis called the Family of God. Life begins with the family of Godthe Father, Son and Holy Spiritand then the Bible takes us all the way through from the creation of mankind in the image of God to how God builds his family for eternity to be with him forever, concluded in the last two chapters of the Book of Revelation. You can make this discovery yourself by reading and following the Bible verses in this fourth book of the Family Bible Studies Series called The Theology of the Biblethe Family of God. See how God does this reading through the books of the Bible and how you, too, can come into the family of God. The Family Bible Study Series is put together to be a very helpful aid for individuals and parents to have Bible studies for themselves and with the family. It is also an excellent benefit for counselors, premarital and remarriage guidance, church leadership Bible study for support to individuals and family development and youth group Bible studies. 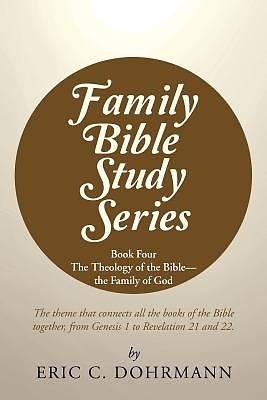 Enjoy finding the discoveries and benefits of The Family Bible Study Series.